Every geek pad needs some impressive accessories, and that stack of video game consoles in your living room isn’t as cool as you think. These video game inspired lights add a touch of fun to your place without attaining the level of geekiness that threatens to wander into creepy territory. 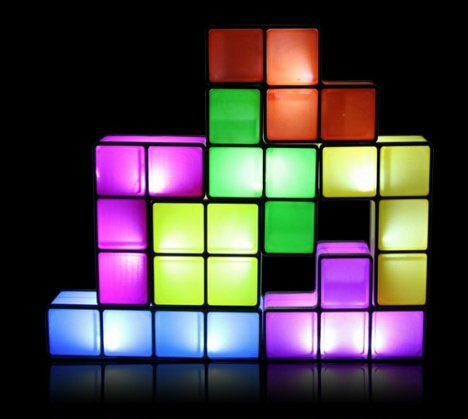 The Tetris desk lamp not only pays homage to one of the greatest and funnest video games ever created; you can also play with it just like a real Tetris game. Each individual Tetromino is a separate piece which you can stack and re-stack to your heart’s content. Each block lights up as you stack it on top of the others. The lamp is set to be released in late 2012 at an enticingly reasonable $50. We’ve spent endless hours manipulating Mario around and having him bash blocks for pennies, mushrooms and fire flowers. 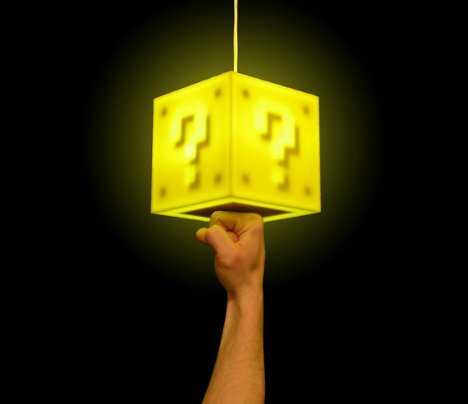 This Coin Block Pendant Lamp from 8BitLit lets you act out your long-standing desire to run around punching blocks and getting rewards. Every time you punch – er, gently touch – the bottom of the lamp, it makes the classic coin sound. Every eighth time you turn the lamp on you get a surprise: a one-up! If the $75 price tag seems a little steep and you’re handy with a soldering iron, 8BitLit also offers the lamp in kit form for $55. See more in Gaming & Geek or under Gadgets. February, 2012.